I love cinnamon rolls. Whenever i go to the bread section i get tempted to these yummy rolls. So i always wanted to make them at my home. This week my long time wish come true by trying out this recipe published in Thursday Magazine. I was really excited when the bread rolls were inside my oven and felt happy when they comes out from the oven. They were soft and yummy with the cinnamon flavour. Baking bread at home is a nice feeling and especially at the time of Christmas with the festive spirits. Sharing the baked goodies with friends and relatives is a happiness shall not be explained by words. In a glass take the warm milk and add sugar and salt and dry yeast. Mix well and set aside to ferment for about 10 minutes or till the frothy layer appears on top. In a broad bowl add the All purpose flour, egg (optional) and milk with yeast mixture and knead well to combine and form a dough. Sprinkle little extra milk if needed to make a slightly sticky dough. Add the softened butter and mix together and make a dough. Transfer the dough onto a flat surface and knead well to make a non sticky, soft and pliable dough. Take the bowl and punch the dough and make the dough into a big round ball shape; set aside. Transfer the round dough on top of a floured flat surface and roll the ball into a big rectangle. Spread the softened butter on top of the rolled dough using fingers. Spread the cinnamon sugar mixture all over the dough. From the longer side of the rectangle start to roll the dough to one end to other to make it as a log. Cut the log into even sized roundels of 1 inch thickness using a knife. 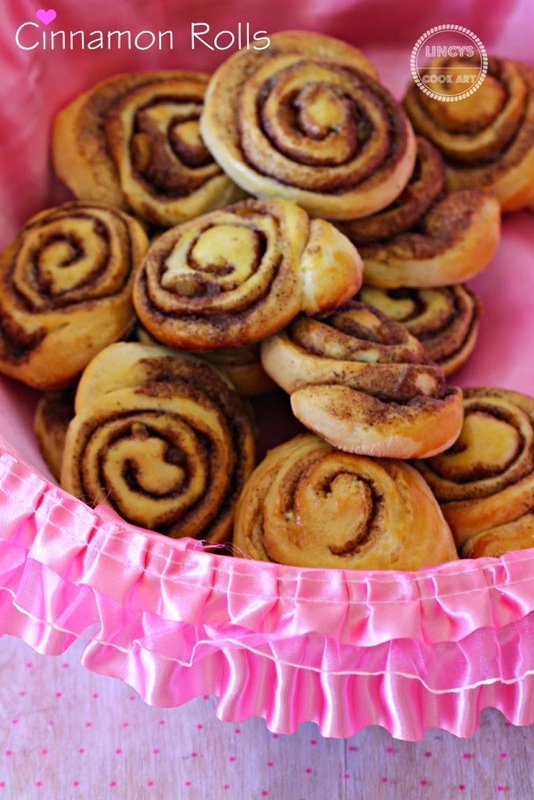 Place the cinnamon rolls on top of a baking tray lined with butter/wax paper. Allow the rolls to raise for about 1 hour in the baking try in a warm place. Transfer the baking tray in a 180 degree preheated oven and bake the rolls for 10 minutes. Take the tray and brush the rolls with butter or beaten egg yolk. Keep the tray again and bake till golden colour appears on the bread rolls for about 20 minutes. Dust with icing sugar/ powdered sugar if you like.